All-season tyres are a good compromise between summer and winter tyres, even if they can not keep up with the best products of these special tyres. This is mainly due to technical reasons, because tread and rubber compound are fundamentally different depending on the season. Temperatures and road conditions make different demands on a tyre and an all-season tyre must therefore always cope well - a big challenge for manufacturers and yet there are all-season tyres that are suitable at least for regions with moderate weather conditions. All-season tyres must not wear out too fast, although they are in use all year long. Therefore check the tread depth regularly. The law prescribes at least 1.6 mm for cars, experts recommend even 4 mm. All-season tyres must provide good handling characteristics both in hot and cold conditions. Aquaplaning in rain is just as undesirable as starting problems on ice and snow. These all round tyres should thus be able to prevent this issue. If you have found a tyre managing this, you can save a lot of money. On the one hand you need only one set of tyres, on the other hand costs for tyre change and storage drop. Automobile clubs and professional journals test the quality of all-season tyres at all price ranges regularly. The results are very different and should be included in the purchase decision. 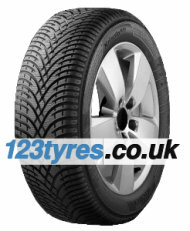 123tyres.co.uk offers a wide range of all-season tyres of many manufacturers at low prices. We constantly have a large selection in stock and deliver quickly and reliably. If you order at least two tyres shipping is free of charge. If you buy your tyres from us, we can even help with getting your tyres fitted. You can pay by bank transfer, credit card or Paypal - the delivery time is between one and three days. As you can see, we are not only on a mission to provide you with a wide selection of cheap name brand tyres, but we also want to get you back on the road as soon as humanly possible.